Kung binabasa mo ‘tong article na ‘to, malamang nabalitaan mo nang may nilbas na public advisory ang S.E.C. regarding our company Unity Network (Unitynet Corporation). Ang intensyon ko sa article na ‘to ay i-educate ka kung ano ba talagang ibig sabihin ng advisory na ‘yun, at kung anong epekto nun sa’ting mga students, customers at affiliates. Q: What’s the meaning of advisory? A: An official document that provides ADVICE. Q: What is an advice? A: An opinion about what should be done, …in tagalog PAYO. Breakdown natin ‘yung payo ng S.E.C. para maintindihan natin ng maige. Unahin natin yung pinaka conclusion nung advisory dahil yun ‘yung importante sa lahat. 1. ARALIN NG MABUTI – Walang sinabi ang S.E.C. na may nilabag na batas ang Unity Network. Wala din silang sinabi na wag bumili at wag makipag-transaction sa Unity Network. Isa lang ang binigay nilang PAYO sa publiko. Yun ay mag-ingat or aralin muna ng mabuti bago bumili at makipag-transaction. Bakit daw mag-ingat? Kasi may nagsabi daw sa S.E.C. na nagbebenta tayo ng securities or investment. SECURITIES: According sa The Balance; Securities are investments traded on a secondary market. The most well-known examples include stocks and bonds. Securities allow you to own the underlying asset without taking possession. INVESTMENT: According sa Investopedia: An investment is an asset or item that is purchased with the hope that it will generate income or will appreciate in the future. In an economic sense, an investment is the purchase of goods that are not consumed today but are used in the future to create wealth. Ang common examples ng securities at investments ay Mutual Funds at Stocks. Nag-invest ka kung nagbigay ka ng pera sa isang kumpanya, tapos wala kang nakuhang kahit anong produkto o serbisyo. Ang nakuha mo lang ay expectations na kikita o tutubo ang pera mo in the future. That’s it. Tapos later on pwede mong i-benta o i-pull out yung investment mo. With Unity Network we do not sell or offer any investments. We sell products and services na naka-focus sa business education, ecommerce at affiliate marketing. Tuwing may-customer na nag-babayad… nage-enroll or nagpe-purchase sila ng isa sa mga education or training products ng Unity Network. Isa sa mga online courses, seminars, masterminds natin. Mga products na magtuturo sa kanila kung paano magsimula, mag-patakbo (Operate) at mag-palago (Scale) ng negosyo. Below are the list of currently available products of Unity Network. Bawat perang binabayad ng customers/students sa Unity Network ay may kapalit na produkto na may mataas na value. 10 Step Training Program – Online course with 10 modules delivered online via student web portal and videos. 30 Days Traffic Implementation Program or 30 T.I.P. – Online course with 10 modules delivered online via video. Interviews With Online Millinaires – Recorded interview with top online marketers. 1 On 1 Coaching – 30 mins to 45 mins 1 on 1 consultation and coaching with one of our coaches via video or audio call. Live Chat and Knowledgebase Support – Access to our live chat support and knowledgebase articles. Customer Support – Access to our live chat support and knowledgebase articles. Affiliate Program – Option to apply and participate in Unity Network affiliate program. Gold Masterclass – A modulated online course that will teach you how to create your own online marketing sales funnel that will consistently bring in fresh new leads and customers for your business. Web Host – Free website hosting worth at least P5,000 every year. Access To Gold Private Group Page – A private facebook community group page exclusive to Gold level students where customers can post or ask questions. Titanium Seminar – 1 ticket to attend our Titanium whole day seminar where you will learn effective Sales & Marketing strategies from some of the best marketers. You’ll discover how to really build and grow a multi-million peso online business from the comfort of your home. Titanium Freedom Formula – 8 modulated online course that will show you how to create the freedom and lifestyle you want with an online marketing business. Titanium Vault – Get access to all the highlights recordings of all past Titanium Seminars. Access To Titanium Private Group Page – A private facebook community group page exclusive to Titanium level students where customers can post or ask questions. Platinum Mastemind Retreat – 1 ticket to attend our 3 days and 2 nights Platinum workshop and mastermind retreat. In this mastermind you will learn how to scale your business to the next level of success. You’ll also be meeting other like minded individuals that can also give you valuable tips and advice for your business. Facebook Ads Formula Advance – A modulated online course that will show you how to leverage the power of Facebook advertising to generate unlimited supply of leads. Platinum Vault – Get access to all the highlights recordings of all past Platinum Masterminds. Access To Platinum Private Group Page – A private facebook community group page exclusive to Platinum level students where customers can post or ask questions. 2. 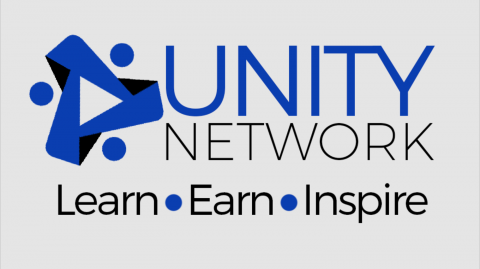 AFFILIATE MARKETING – Siguro, kaya inaakala ng iba na nag o-o-offer ang Unity Network ng investment ay dahil may mga testimonials tayong pinapakita na kumikita sila sa Unity Network. Yung mga income na kinikita ng mga students at affiliates ng Unity Network ay galing sa mga affiliate commissions “Komisyon”. Ganito s’ya nagwo-work. Yung mga students ni Unity Network ay may option na maging affiliate. Bilang affiliate, pwede nilang i-promote ang mga products ng Unity Network. 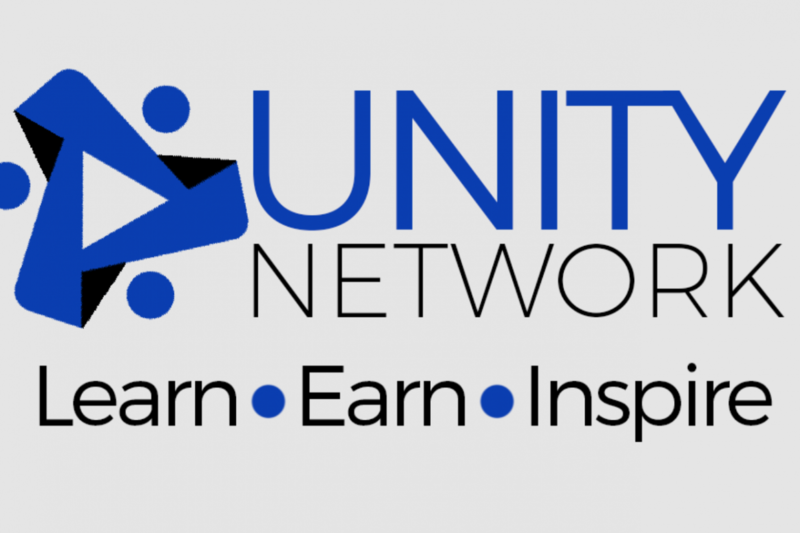 Most of our affiliates use advertising platforms and social media to promote Unity Network products. Pag may bumili mula sa advertising at promotion effort nila, dun sila babayaran ni Unity Network ng affiliate commission. As far as I know hindi illegal na kumita ng referral based na sales na ni-recommend mo sa company. Car salesman kumikita ng commission at mga direct sales professional ay kumikita ng commissions. Big companies even billion dollar companies used this busines model kagaya nila Amazon, ClickBank, eBay, Lazada, Zalora, and many many more. 3. FROM WHO? – Hindi din natin alam kung kanino galing yung impormasyon na nakuha ng SEC. Hindi natin alam kung student, customer, competitor o baka gusto lang manira yung caller. Ibig palang sabihin kung sino man yung kumontak sa SEC ay walang binigay na mga katibayan. Naiintindihan natin ang SEC dahil ginagawa lang naman nila na protektahan ang publiko sa mga possible investment schemes. Mas fair siguro kung makikipag-ugnayan muna ang SEC sa mga companies bago maglabas ng advisories. ANONG AKSYON ANG GINAGAWA NATIN – Nakikipag ugnayan na tayo sa SEC since last week pa.
Our attorney is in the process of sending S.E.C. a manifestation letter. Yung letter na ‘yun ang maglilinaw sa kanila na hindi tayo nagbebenta ng securities or investment. 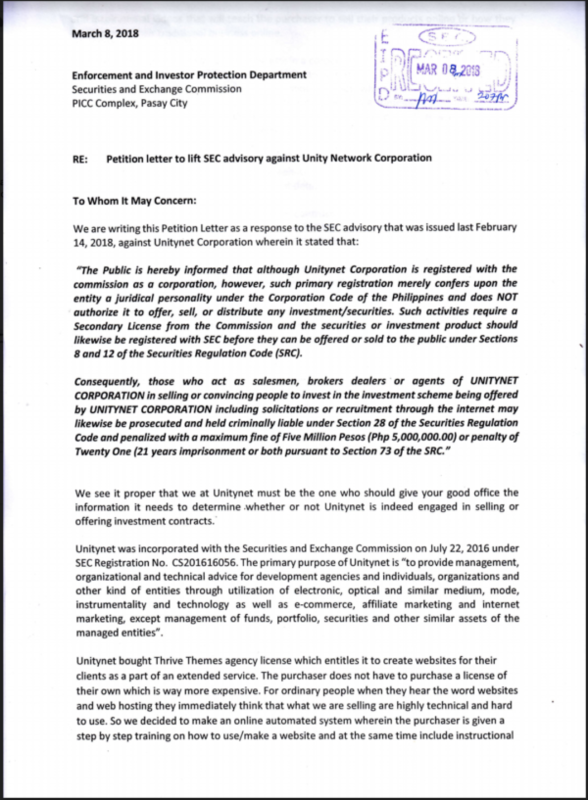 Yun din ang maglilinaw sa SEC kung ano ang mga products, services at pano nagwo-work yung business model ng UnityNetwork. Ecommerce and Affiliate Marketing are both legitimate model. Mga business models yan na ang tagal nang namamayagpag sa mga 1st world country. Here’s the front page copy of our letter to SEC. Possible na wala pang sapat na idea ang S.E.C. sa mga business models na ito. Kung magre-register ka mga ng company name sa SEC wala kang makikitang option dun na category about ecommerce, affiliate marketing, or somthing similar… Others ang ilalagay mo. Ang daling sabihin pero hindi yun ganun kasimple. 1. Hindi din nila tayo bibigyan dahil pag tinignan nila ng mabuti, makikita nila na wala naman talaga tayong binebentang securities or investments. 2. Kung sakaling bigyan man nila tayo, lahat ng affiliates ay kaylangan nang mag-test at mag-apply ng lisensya to sell investments kagaya ng mga stock brokers. Hindi na ecommerce at affiliate marketing ‘yun! TO AFFILIATES & STUDENTS – Kung affiliates ka ng Unity Network, palagi nating siguraduhin na ethical ang promotion na ginagawa natin. Never misrepresent our products and services. Hindi tayo nagbe-benta ng investment. Ang binebenta natin ay mga educational at training products na magtuturo sa mga students pano magsimula, mag-patakbo (Operate) at mag-palago (Scale) ng negosyo. OK lang gumamit ng mga results sa promotions mo, pero siguraduhin natin na hindi mapagkakamalang investments ang mga products at services natin. Kung ikaw naman ay students, customers at affiliates wala kang dapat ipag alala. Again advisory sa tagalog ay PAYO lamang. This advisory doesn’t mean na may maling ginagawa ang company, at lalong hindi ibig sabihin na kaylangan nating huminto. I want to share with you our company’s core values. This core values will guide us in overcoming this challenge. B: Believe – We believe in people and their dreams. E: Empower – We empower and inspire. L: Lead – We lead by example and we always do what is right. I: Improve – We are always willing to learn to improve. E: Eagerness – We are eager in facing challenges. V: Value – We care & we value our people (Customers, affiliates and employees). E: Educate – We love sharing ideas and educating people. I believe and I know that we can pass this test soon. Soon isa na ‘to sa magiging inspiring story natin. We will look back and we will tell the story how we overcome this challenge. My promise to you is this… Hindi tayo gagaya sa ibang mga company na nabigyan lang ng advisory ay nawala na at huminto na ng operations. Regular operations pa din tayo. You can definitely still promote as an affiliate. Hindi din tayo papayag na mahinto dahil napaka laki ng vision at purpose ng company natin. We will continue to fullfil our vision and our purpose. Thank you for your support and for your love in our community. PS – Kung student Or customer ka ng Unity Network, please comment below and share any feedback or testimonials mula sa mga produkto at mga services na nabili mo mula sa Unity Network. Sa ganung paraan talagang makita ng marami na maraming very satisfied customers si Unity Network. Thanks Coach Eduard for this quick response regarding sa Sec advisory na ito. As an affiliate of UN napakalaki na ng naitulong nito sa akin and sa family ko. 1 of the living proofs of UN ako. From the trainings, yung 2990 palang na enrollment fee sulit na sulit na yung maaccess mo eh, kung wala ka alam sa pagbbusiness or may existing business ka, tlagang tutulungan ka sa tamang pagnenegosyo at ma scale up ang business mo. Lahat ng online courses and training products of UN is really a big help lalo na kung you are looking for a breakthrough in life at gusto mo maggrow ang knowledge mo,skills mo etc. Kudos to Unity Network!! Yes! I am fully supporting Unity Network Vision, Mission and Core Belief. Naniniwala ako na makatulong ito sa akin, sa pamilya ko sa ka Team ko at sa buong CommUNity ng Unity Network!! Godspeed! !